It is essential to measure the elongation of test specimen under load, to have it's mechanical properties. FIE Extensometer Model EM-1 is intended to serve the above purpose. So that the knife edges bite the specimen to avoid any slip. 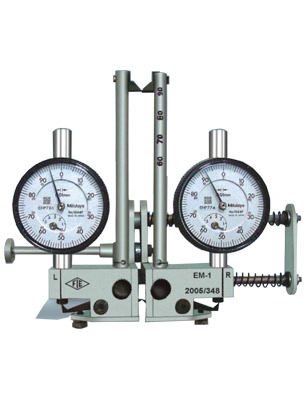 The upper edges are adjustable to provide different guages lengths for measurement. As deformation takes place the lower knife edges transfer the movement to the dial guages and the deformation of specimen is shown on dials, so that the change in length of specimen by 1/100mm, equals to one division of the graduation on dial. 120 x 50 x 150 mm Approx. • Due to constant R & D, specifications and features are subject to change without notice. • The diamensions given above are approximate. 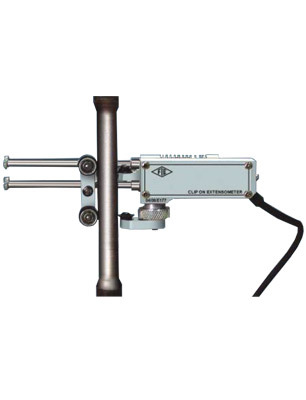 • The electronic exensometer, Model EE-2 is manufactured as per IS:12872:1990 & ISO 9513:1989 in class 1 accuracy. • This equipment is basically used with Universal Testing Machines for tension test, It is used for measuring young's modules, proof stress or yield stress. • EE-2 extensometer requires electronic signal conditioning PCB to interface it with UTM electronic panel. • EE-2 with guage length 25.4, 62.5, 70 & 80 mm. • Specimen thickness or dia 4 to 40 mm & 4 to 50 mm.